This essay is written by Kimberly Haynes Robertson, a proud member of the Lebanese-American community. I have vivid memories of Sunday afternoons spent in my grandmother’s general store in McDonough, Georgia. As a small girl perched atop a stool behind the counter, I could observe most things happening in and through the vertical aisles holding various merchandise. A bell attached to the door rung politely each time customers entered, and I seldom tired of watching the many neighborhood shoppers who came in search of things. Paper towels? Green beans? Windex? Salt? They’d point a finger over their shoulder and shrug, unsure where to begin. My grandmother smiled, often greeting them by name, and offered directions to the correct aisle. I imagined I could tell what people sought based on the facial expressions they wore as they stepped through the door. I tried my best, but it never worked. Evidently, the desires of the heart cannot be forecast accurately by countenance. My grandmother, Helen Mansour, was the first of eight children born to Joseph and Raya Mansour. Joseph and his brothers traveled with their young wives to the United States in the spring of 1914, leaving their families and home country of Lebanon behind as they searched for better opportunities. Other than the promise of hard work leading to great prosperity, they brought with them the transportable pieces of the Lebanese culture they held dear. The young couples’ families were merchants by trade in Beirut and Zahle, and my great grandfather and his brothers each opened various mercantile shops when they arrived in Georgia. My grandmother, who was born in 1916, picked up the family trade as she turned twenty years old, intent to provide for herself and her younger siblings after the unfortunate deaths of both her parents at a young age. I listened to these family tales over the years while I sat on that stool in her store, imagining the experiences of my great grandparents as they built the life that led to mine. It was a foreign place, my grandmother’s store. People were different there…exotic, fascinating, curiously intriguing. I heard phrases uttered in a foreign language, and saw faces which looked familiar, yet I didn’t easily recognize them. During each visit, I encountered an array of aunts and uncles who happened by on their way to someplace else, coming to the store to catch up or help out, pump gas or stock shelves. My father would try again to explain our relation, but I could never quite comprehend which young Joseph, George or Rose belonged to whom. I learned to stay sharply aware of the flow of activity lest I miss a jewel of information, which I fretted might pass by without fanfare and take with it any possibility of solving the puzzle that is our great and complicated family tree. Besides our Sunday afternoons at Grandmother’s store, our extended family gathered together at each holiday, and inevitably our gatherings centered around family suppers, delicious and copiously laid out on the table of one of my aunts. Certain favorites, such as Aunt Bonnie’s pies, were as eagerly anticipated as Santa Claus at Christmas, and we cousins would have been equally disappointed by the truancy of either. I liked lingering with our large and boisterous family at those reunions. It was as if I entered a parallel world of colors, textures, depths and facets of family, complete with boundless stories of creativity, industriousness and courage. The mix of Lebanese culture with southern hospitality made an interesting blend, two worlds forever combined, whisked together into a new flavor of family. Among the ubiquitous parade of relatives who would appear at these holiday gatherings was Uncle George who, with his wide brow and deep set eyes, sure looked like he belonged to the rest of us, yet he wasn’t my dad’s brother. “So, whose brother is he again?” I quietly asked my father. I watched as Uncle George stood clapping and stomping in time with the music playing on my aunt’s stereo, attempting with great earnestness to involve everyone or anyone in after-dinner dancing. His taste in music was eclectic, vacillating from disco to Lebanese to country western. The only seeming prerequisite was that it be loud enough to cause a thumping vibration in the bones of those nearby. Cocking my head, I puzzled once more through the family lines, trying to figure out to whom I should attribute such an amusing but intimidating uncle. Yet it didn’t matter. Not really. At some point my confusion gave way to the realization that the technicalities of connection mattered very little. Uncle anything was good enough for tying family lines together through generations of shared celebrations. The years passed, and my sister, Sharon Haynes Gruber, and I each branched off into our own section of the family tree to begin our lives as mothers, she in Georgia and myself in North Carolina. We, too, have shared the stories of the Mansour brothers with our own children, fielding questions as best we can concerning the connections between each brother and his descendants. Due to fate or God’s blessing, whichever you might cite for the good fortune rained down upon us, Sharon settled into a life surrounded by Mansours in Newnan, Georgia. 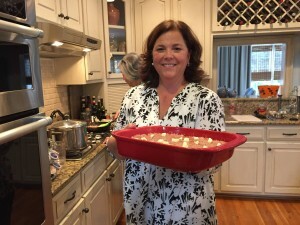 While raising her family in this small Georgia town about 40 minutes south of downtown Atlanta, Sharon served soccer team dinners and church suppers, prepared 4th of July picnics and spooned Halloween chili, all while enjoying the camaraderie of her Mansour cousins. As I contemplated the benefits Sharon garnered from unfettered entry to the coffers of family cuisine, I came to an important conclusion: I wanted in on the action. For many years, Sharon and I have traded favorite recipes, and often these recipes found their genesis in the kitchens of a Mansour aunt or cousin. (After all, who can tell the difference?) My sister has been most generous in sharing the favorites she gleaned from church or family cookbooks, but I wanted to learn firsthand how to cook Lebanese dishes, preferably before preparing the next Thanksgiving feast. Sharon has the lion’s share of our access to authentic Lebanese recipes due to her Coweta County proximity to extended family. Therefore I wisely recruited her help in enlisting our cousins, sisters Connie Mansour Flanagan and Joy Mansour Baranco, as cooking instructors. In October, I drove to Newnan from my home in Winston-Salem and gathered with my sister, and my mother, Anita Haynes, as we became the sous chefs for Connie and Joy, who eagerly accepted our invitation to a Mansour Family cooking party. We spent several hours in Sharon’s kitchen learning how to make kibbeh, hummus, stuffed squash, and rolled cabbage. We nibbled as we cooked; we laughed at the banter which is typical between sisters; we plowed new ground with cherished memories. I looked across the kitchen filled with women I love and resolved to hold steady to the values that brought us together. I want my own children to know these recipes, to taste the same foods previous generations laid on the family table while they celebrated, and to remember that these shared experiences bind a family throughout time. Connie and Joy brought no measuring cups with them to our party. They often cook by memory, the recipes ingrained in them through years of practice, handed down from their own grandparents, and perfected with the knowledge of their families’ particular tastes and preferences. During our hours together, I basked in feelings of awe, tenderness, and pride. I was absolutely goofy with excitement, well aware I was in the midst of a mighty and rare occasion. Is it possible that brothers Ellis and Joseph Mansour could ever have imagined this? Their granddaughters and great granddaughters stand together in a kitchen well over a hundred years after the brothers traveled to the United States; we’re laughing and sharing stories of how the Mansours’ journey made a place for us. As we prepared the recipes they brought with them from Lebanon, I understood with greater poignancy the impact family history has on our sense of identity and belonging. As I plan my own family’s Thanksgiving meal this year, I’m determined my children will learn to make kibbeh. And we’ll serve it with a side of Mansour family history, shaken from the lovely limbs of our capacious family tree. Thanks for reading and thank you for your response. We will pass this note along to Kimberly. Great article! Your article may have opened up a light at the end of a long tunnel for me. My name Ray Frangie, founder of the Frangieh Family Genealogy Project, currently with 9,200+ people on the extended family tree, and I have a member from the Mansour Family that was incorrectly placed on the tree (which has been fixed now), however she is now isolated with no path, which I’m hoping you might be able to shed light on. This person in question is known on the tree as Amelia Sarkis Mansour MANSOUR (~1898 – ~1964). She is married to Majed Gerges Sleiman FRANGIEH (AL-BADWEH SLEIMAN) (~1896 – ~1973). Here’s hoping that there is some relation or information in your family tree history that you may be able to share. Thank you for reading the blog and thanks for your insight. Kimberly has done some work in genealogy, so we will pass this along to her. We will also pass it along to our Senior Researcher who conducts ongoing historical research and may be interested to learn about your project. I’m married to one of Connie and Joy’s nephews, Ben Mansour, and since the first family Thanksgiving I attended with him, I’ve known the feeling of overwhelming love and welcome offered by my husband’s family. I’ve learned to make several of the Thanksgiving treats mentioned in the article and enjoy making them for my very appreciative, mostly Scottish based family. Kibbeh had become an ingrained part of our holiday celebrations, as well as the love and family warmth that comes with it. I’m truly blessed to be part of these wonderful people’s lives. I have high hopes of getting to go with my husband to Lebanon some day and meet even more of my happily extended family. Loved that article! Thanks for supporting the Center and thank you for your response. We’ll be sure Kimberly, the author, receives this note. The Mansour’s were the first group of families that we met when we settled in Newnan in 1966. They still hold a special place in our hearts. Such a wonderful family.